From the Soo Locks across the St. Mary's River in Sault Ste. Marie in Ontario, Canada, the sunset hues highlight the sky along with the International Bridge and train bridges. While visiting the Soo Locks in Sault Ste. Marie in Ontario, Canada the scenery of the International Bridge and the train bridges below are beautiful in the sunset lighting. The sky takes on a yellow glow silhouetting the trees and sections of the Soo Locks on either side of the waterway. The International Bridge crosses between Sault Ste. Marie in Ontario, Canada and Sault Ste. Marie in Michigan, USA. The train bridges below are used for shipments between the USA and Canada cutting the time down considerably instead of using boats. Sunset is one of the prettiest times of day along the Soo Locks as the sun disappears leaving behind its yellow hues and reflections across the surface of the river. 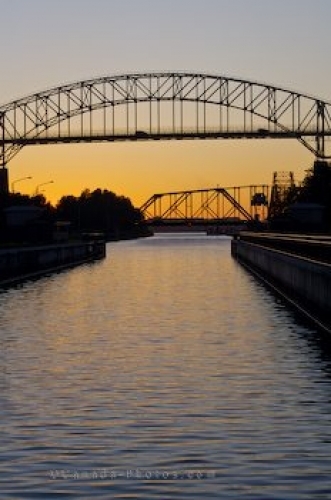 Picture of the bridges in the sunset from the Soo Locks in Sault Ste. Marie, Ontario in Canada. ... the St Mary's River seen from the Soo Locks, Sault Ste Marie Lock National Historic Site in the city of Sault Ste Marie at sunset, Great Lakes, Ontario, Canada.